AIR COM Radio & Mode S Transponder in one. For the first time it is possible to combine the control of a radio and an external MODE-S transponder into a single compact 57mm instrument. To facilitate this, a mode-S transponder (the AIR Avionics VT-01 main unit) can be connected to the AIR Control Display. Panel space is precious, displays get larger, and an ever growing number of instruments needs to fit into shrinking panels. AIR COM comes to rescue. 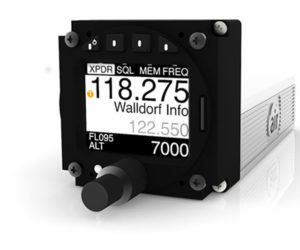 Directly connecting the mode-S transponder to the AIR Control Display means that both instruments together only need a single small 57mm cutout. This is a big step towards more panel space and saves costs.